160" x 100" x 72"
Since the earliest times, the shadow has proved existence – the ghost has no shadow. However, like the “virtual” image projected on a TV monitor, the shadow itself has no substance. And at the same time, the shadow, or the silhouette, appears as the basis of the image. In KAGE, computer-graphics shadows of cone-shaped objects explore this shadow-substance characteristic. 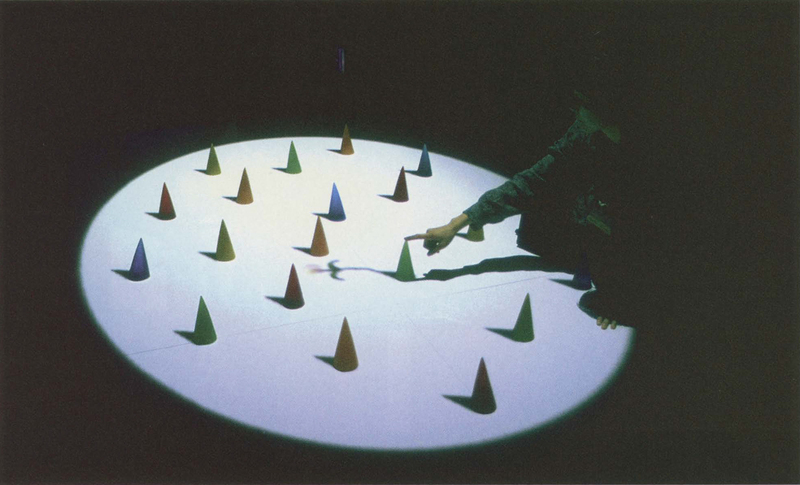 The computerized shadows projected toward the floor are motionless, like all shadows, but as time passes, some of them begin to tremble. When the objects are touched, various kinds of patterns appear on the computerized shadow images. The ceiling-mounted projector also illuminates the viewers, so their shadows join the shadows of the objects on the floor. When the false shadows created by computer graphics and the viewers’ true shadows are both projected on the same plane, viewers recognize the shadow-existence dilemma.